As I was thinking about my Christmas posting schedule it occurred to me that, when it comes to holiday food, I have a lot of the favorites covered. Not to say I’ve posted them all (I’d be putting myself out of business), but I feel good about our holiday recipe list. One area we are woefully short, however, is the land of cocktails. Which is problematic as cocktails can be an important part of the holiday partying! As such, I am excited to announce that this December we will toast the holidays with a month of cocktail recipes! First up is one of my all time favorite mixed drinks, sangria. 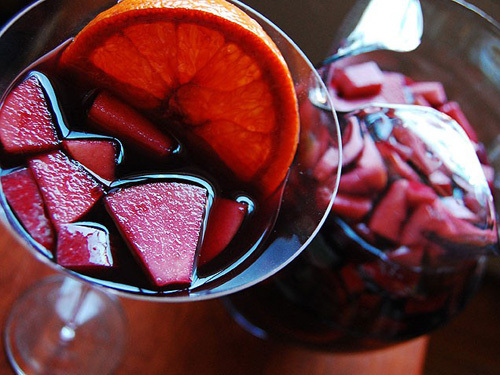 Sangria is great all year round, but I especially love it in the fall and winter because the combination of red wine and brandy is warm and so lovely. It is a great cocktail for both brunches and dinners, and the best part is that making it in advance and letting it hang in the fridge only makes it taste MORE delicious! It’s like it knows you’ll be busy making other things. Enjoy, and check our holiday cocktails list (and watch it grow) this month! In a large pitcher, mix wine, brandy, and triple sec. 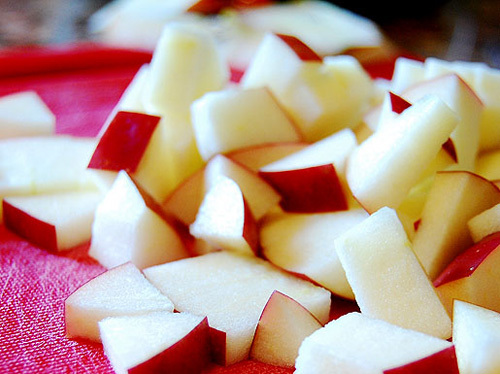 Slice your oranges, dice your apples and pears, and add them to the wine. Allow mixture to sit in the fridge for at least an hour so that the fruit can soak and the liquid can mix. I like to keep a bag of grapes in the freezer to use as “ice” for drinks without watering them down. When you’re ready to serve, add a few grapes to each glass. 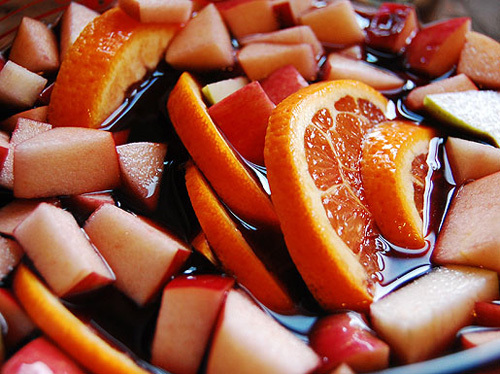 Either fill all the way with sangria, or for a lighter drink, fill ¾ way with sangria and top off with club soda. Season’s Greetings! Sounds so lovely – and it definitely looks pretty! What a great way to use seasonal fruits. I can’t wait to try this recipe and share with a friend! Thank you! it looks so good and refreshing!